"Danger Lorelei, he's coming." Icy whispers brush against her cheeks when she's sleeping. Most nights she wakes to the voices of her ancestors, always at 2:47 a.m. Like all monsters, only the light keeps them at bay. Lorelei Huntington knows what it means to fall for the wrong guy. She knows what it's like to hide in the dark and wait for the light to save her. She knows how it feels to watch while everyone you love and everything in your life is taken. After 50 years of looking over her shoulder and running for her life, certain she could feel his breath at the base of her neck, the icy voices come back. Again their whispers find her vulnerable and exhausted, just as they used to. Fearful of seeing him again but desperate for answers, she goes home. What she finds isn't exactly what she left. Who she finds isn't exactly dead or aged a day. But then again, neither is she. 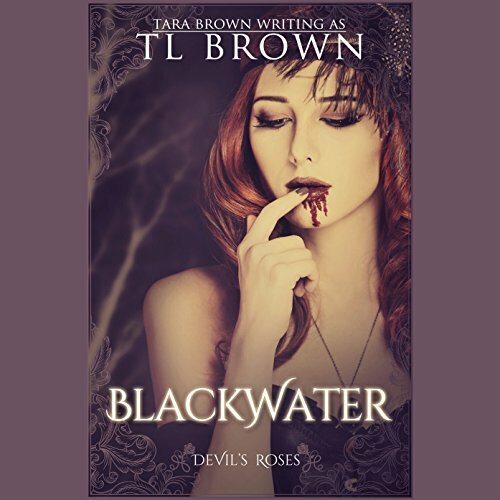 Blackwater: Mature content warning. ©2012 Tara Brown (P)2015 Audible, Inc. Loved the beginning of the book, hated it from the middle onwards. The first half of the book had me on my toes. It was charming and exciting. Then it started getting creepy and scary. The kind from a good horror movie. However past the middle, Lorelei started to get really annoying. A nasty beech even. I just can’t bring myself to even like her anymore. Her actions are of a petty child. The story starts from when Lorelei was young. Lorelei’s mother hates her. She constantly berates, calling her fat and doesn’t seem to act like a normal mother should. We later on learn why. Her mother is trying very desperately to have Lorelei wed off. In the midst of it, Lorelei met Whit when she almost died of heat stroke; being trapped in the middle of no where. They formed a bond and the connection was real. The story went on till something ominous happened. As the reader, we will have to wait a looooooooooong time for Lorelei to get her sheat together. She went through hell but I do believe any normal person would want to understand and know what happened to her loved ones rather than run for 45? 50? years. Not especially when Whit was trying his damnest to explain things to her. She goes to “LALALA I DON’T WANT TO LISTEN TO YOUR EXCUSES” mode most of the time. Ugh. Whit did something wrong but had showed that he would never hurt Lorelei in anyway. After the reunion, all Lorelei did was run when she meets with the tiniest problems. She literally runs away from all her problems (at least 3 times since the reunion). When Whit finally has the chance to explain, she blames him for not telling her earlier. It went from bad to worse from there. I couldn’t stand Lorelei anymore. She’s 60+ and yet she’s acting like she never aged. I can relate to the younger Lorelei as she was trapped in a conservative family. But after 50 years of living, I think she should grow up some. The 2nd half of the book felt like a nice guy chasing a snotty princess whose ghost sister and ancestor have anger issues. Rather than helping her or explaining things that Lorelei clearly doesn’t understand, they pull the “I-tried-warning-you-for-years” crap. Ugh #457892162. I wish there was a whole series for these characters it was an amazing story. I really liked this story. It has a bit of everything you want in story.